Twins Riley and Carly Koenig didn’t have a definitive plan when they began classes at Tidewater Community College in 2012. Now the 24-year-olds have a career they love with an eye toward opening their own business. Twinzy Designs, opening in the Outer Banks on a date not yet determined, will showcase the stunning glassware the pair mastered as part of TCC’s glassblowing program. 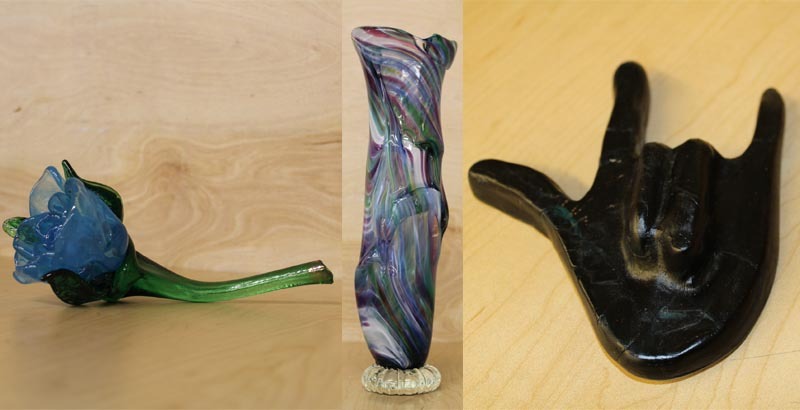 Both will graduate on Dec. 19 with an Associate of Applied Arts with Specialization in Glass. In addition, they earned a Career Studies Certificate in American Sign Language. They are the first in their family to graduate from college. As students in TCC’s glassblowing program, the Koenigs worked in the Hot Shop, a rooftop studio atop the Visual Arts Center (VAC) in Olde Towne Portsmouth. The state-of-the-art facility includes tools, molds and other equipment for glass grinding. They then followed up in the Cold Shop, honing their expertise in fusing, slumping and glass painting. Glass-blowing requires teams of two, perfect for the Koenigs. They enjoy teamwork and drove from Currituck, N.C., to complete classes at the VAC and Chesapeake Campus. Riley’s specialty is roses, which require intricate detail; Carly prefers larger vessels, such as vases. “All of the teachers at the VAC were awesome,” Carly said. “They actually enjoy what they teach. The Koenigs would like to continue their arts education at Virginia Commonwealth University. They would model their own studio after the Chrysler Museum Glass Studio. They also want to be inclusive of the deaf community, using the ASL skills they learned at TCC. They became interested in the program after watching their grandmother struggle with her hearing. The sisters recommend the glass program to anyone who’s curious about it. Patience and a tolerance for heat are a must.